Downtown housing has long been a priority for the DDA as it is a key component of a balanced economic development strategy of diversification. In 2015 the DDA commissioned a Downtown Housing Study that looked at opportunity sites and potential demand for Downtown Housing and found that while demand existed there were significant financial hurdles to making projects occur, which still exists today despite the improved market conditions. The supply for new residential has not kept pace with the recent uptick in demand as Mesa County currently has only a two month inventory and one of the lowest vacancy rates in Colorado. Downtown Grand Junction has seen limited residential or mixed-use infill to support the increased business activity and there is still a significant amount of vacant property with 37 sites being identified within the Central Business District of the DDA Boundary alone. The DDA made significantsteps to help with this shortage by working with REgeneration Development Strategies and Senergy Builders on potential infill housing developments. The DDA issued an RFP for the residential infill development for the former R-5 school site and White Hall in 2016. REgeneration Development Strategies was chosen as the developer and in Fall 2017 a purchase and sale agreement with REgeneration was reached to develop old R-5 and White Hall sites into residential units with potential for light commercial use. The development will be phased with the first phase being 36 market rate townhomes behind the R-5 school that will feature modern features as well as amenities such as a community garden and interactive public space. 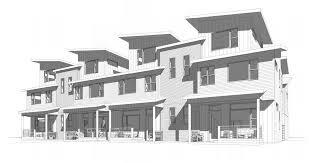 White Hall is slated to become mixed use market rate apartments with 40-50 units. The initial concept for the former R-5 School is for the building to be repurposed into lofts but the DDA is partnering with REgeneration to look at other potential uses for adaptive reuse of the building.